The tourbillon is one of the most elegant and inspired complications in the history of watchmaking. As simple in principle as it is difficult to make, the mechanism was designed to eliminate the errors of rate caused by gravity on a pocket watch carried in a vertical position. Weighing mere fractions of a gram, it consists of a mobile cage that contains all the parts of the escapement, with the balance at the centre. The cage completes one revolution around its own axis every minute, therefore ensuring that the balance wheel oscillates at different positions in the course of its 360 degree journey and that the rate remains as constant as possible. Counteracting the overall force of gravity. The TE8 Tourbillon heralds the Royal Collection that combines classical styling with innovative, state-of-the-art technology. The letters ‘TE’ stand for tourbillon escapement. Some of its more distinctive features are obvious at first glance The partially openworked dial and guilloche accentuate the design features. Compared with other more conventional tourbillons found today, the TE8’s movement is said to be ‘inverted’: in other words, most of the technical elements and visually interesting features can be seen on the dial side, when they would normally be hidden away on the reverse, allowing for more interest to be taken in the moving parts. The timepiece also boasts a number of typically English technical idiosyncrasies that will interest even the most discerning watch connoisseur. 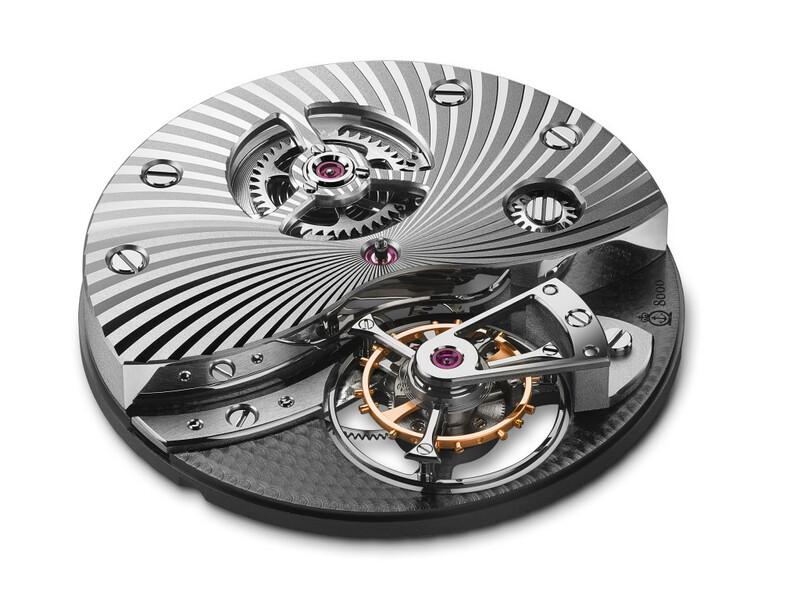 Take the symmetrical layout of the movement, for instance: the barrel spring and the tourbillon cage are centred along the watch’s longitudinal axis. An Englishmen we do rather like order, or some would say that we are just a touch obsessive over these little details. The main jewels are held by screwed gold chatons. They are a reminiscence of the finest Haute Horlogerie mechanical watches of the good old days and contribute to the beauty of the movement. In addition to their aesthetic appeal, gold chatons also allow to replace damaged jewels without modifying the boreholes in the plates and bridges. A closer examination of the winding system and the gear train reveals a traditional construction used in high-end pocket watches that involves the use of wolf-teeth, an asymmetrical tooth system featuring both long and narrow spokes used primarily to improve the smoothness of the overall movement and to enhance its elegant design. Exclusive Arnold & Son tourbillon movement A&S8000, hand-wound, 32.6mm wide, 6.25mm thick, 80hr power reserve, 21,600 vibrations/hr. From an aesthetic point of view, however, the feature that sets Arnold & Son’s TE8 Tourbillon apart is its singularly English design. Some of the more obvious elements include the meticulously positioned three-quarter barrel bridge with its large wave-shaped cut-out and a lavish decoration unique to Arnold & Son, the triangular tourbillon and motion-work bridges, and the three-spoke design of the wheels, which are shaped with such distinctive flair. Needless to say, every detail of this gorgeously understated piece, such as the black and brushed polishing, bevelling and movement decoration, is painstakingly hand-finished by Arnold & Son’s master watchmakers. And guess what, even if you decide to dunk this watch in the water, it is not a problem with its’ 30m water resistance rating. This beautiful tourbillon timepiece will be produced in a limited edition of 25 pieces of each version, in a 44 mm 18-carat white gold and 18-carat red gold case with either a movement with NAC grey treated bridges and black ruthenium treated main plate or rhodium treated bridges and NAC grey treated main plate. Each watch case is individually numbered and engraved.